Nancy Writebol, one of the American aid workers who contracted the Ebola virus in Liberia, is getting stronger every day, her husband David told CNN's Elizabeth Cohen. Writebol remains in isolation at Emory University Hospital; David is under quarantine after returning from Africa, but is showing no signs of the virus. On "New Day" Thursday, Nancy's son Jeremy, who has seen his mom through glass windows in the special isolation unit, reported that he is also encouraged by her progress. "I know that each day since she's been here at Emory there's been progress forward in her condition and care and she's getting stronger and stronger, which is something we really praise the lord for," he said. His mom received two doses of the experimental drug ZMapp before she was stable enough to be evacuated back to the U.S., but Jeremy said he doesn't know more about how his parents decided for Nancy to use the serum. "I know she was very sick and needed some help and that was made available and they went forward with it," he said. Though he partly thanked ZMapp for his mom's progress, Jeremy cited the "incredible" medical staff at Emory as "the key" to helping Nancy recover. Two journalists covering civil unrest following a fatal shooting in Ferguson, Missouri, said they were briefly arrested Wednesday night inside a McDonald's in the community. Wesley Lowery of The Washington Post and Ryan J. Reilly of The Huffington Post said on Twitter that they were arrested while they were doing work and then released within roughly 45 minutes. Neither was charged. "This was very unnecessary," Lowery said in a telephone interview. He said he was never told why he and Reilly were detained, except that they were "trespassing" by being inside the fast-food restaurant. Lowery recorded a portion of his interaction with an officer inside the McDonald's. 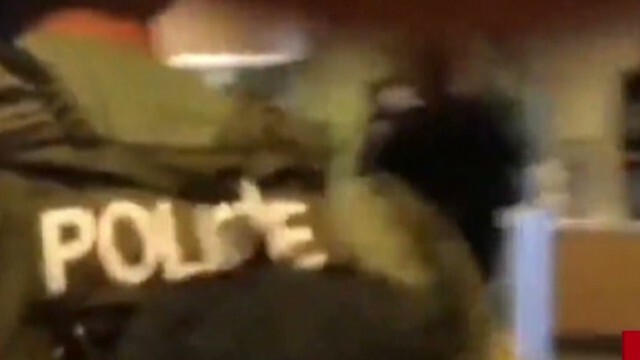 In the video, which was published on The Washington Post's Web site, an officer is heard demanding that he "stop videotaping." Citizens and professional journalists generally have the right to record police activities. Afterward, Reilly wrote in a Facebook post that a police officer "in full riot gear" "purposefully banged my head against the window on the way out and sarcastically apologized." Reilly added, "I'm fine. But if this is the way these officers treat a white reporter working on a laptop who moved a little too slowly for their liking, I can't imagine how horribly they treat others. And if anyone thinks that the militarization of our police force isn't a huge issue in this country, I've got a story to tell you." Lowery emphasized that he did not want his arrest to overshadow the ongoing protests in Ferguson or the treatment of the protesters. "I want this to be about the community," he said. "But this arrest is in some ways an anecdote of what's going on here." The arrests came amid an already-tense situation between journalists and the authorities in Ferguson, the site of last Saturday's police shooting of an unarmed 18-year-old, Michael Brown. There have been several reports of reporters and the camera crews being told to leave protest areas, but no reported arrests until Wednesday. The Ferguson police chief, Thomas Jackson, told CNN he did not know who the arresting officers were. "We had a lot of different agencies out there," Jackson said. At 11 p.m. CDT, Jackson said 18 people had been taken into custody on Wednesday, including the two reporters. 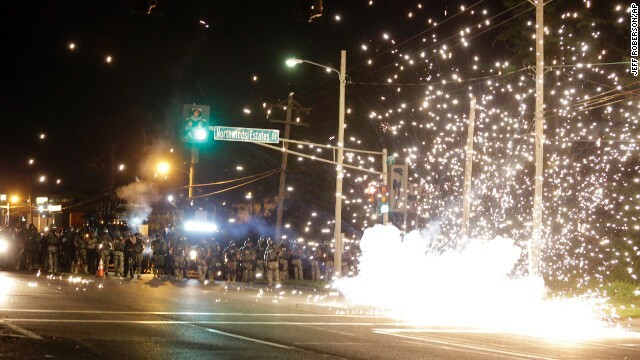 Police clash with protesters in Ferguson, Missouri, after the weekend death of an unarmed teenager. Emotions remain raw in Ferguson, Missouri, as a new eyewitness steps forward in the Michael Brown shooting case. The Mideast truce is extended five more days. And SeaWorld shares tank on Wall Street.